Just six weeks before voters went to the polls, the Government of the Republic of Ireland was forced to withdraw its plans for the country's first all-electronic elections, and revert to the traditional paper-based ballot, at a substantial cost to taxpayers. The proposed system had been criticised on many counts by commentators, politicians, and the independent Commission on Electronic Voting. Accessibility was never a requirement in the procurement of the system, which turned out to be inaccessible to many users with disabilities; the right to accessibility is not enshrined in Irish law, and disability rights in general are not protected. This is in contrast with the situation in the United Kingdom, where all e-voting initiatives must ensure compliance with legislation. This paper examines how, by failing to take into account the needs of a substantial portion of the electorate, the Irish Government's e-voting implementation is no more democratic than the traditional paper-based method, and may even pose additional barriers to full participation in the democratic process. If everything had gone according to plan for the Fianna Fáil (political party) Government of the Republic of Ireland, the 2004 local and European elections, as well as voting on the constitutional referendum, would have been the country's first all-electronic elections. However, just six weeks before voters went to the polls, the Minister for the Environment, Heritage, and Local Government in the Irish Parliament, Martin Cullen TD, was forced to suspend the introduction of e-voting and revert to the traditional paper-based ballot (Cullen, 2004). Total procurement costs for the Nedap/Powervote system have been estimated at €52m ($69.5m) (Irish Independent, 2004), and the voting machines will not be redeployed until 2007 at the earliest, and then only in tandem with other methods of voting. The Government's decision followed the findings of the Independent Commission on Electronic Voting, which objected to the introduction of the voting machines on the grounds that the proposed system compromised accuracy and secrecy (CEV, 2004). It is this issue of secrecy which has implications for disabled people in Ireland: the Commission observed that there was reduced voting secrecy for persons with certain disabilities, so accessibility was compromised (CEV, 2004). However, accessibility was not a concern of the Government until well after electronic voting pilots had been undertaken in 2002; the trials revealed that the new system was inaccessible to many disabled voters. In response to submissions from interest groups, minor changes were made: font sizes on the screens were enlarged, for example, but other opportunities were missed. The machines are equipped with a port to convert voter selections to audio output, but this was not followed through by the Government. The information literature produced to inform the electorate only addressed wheelchair users (who were told that the system was accessible), the visually impaired (who were told that their needs would be considered in the future), and the elderly (who were told that the elderly in other countries were satisfied with the implementation) (Department of the Environment and Local Government, 20032, 2003b). It failed to recognise the range of disabilities which can restrict full and equal participation in democracy; it also failed to recognise that people can have multiple disabilities. The online demonstration of the new procedure failed to achieve even minimum compliance with the Web Accessibility Initiative (WAI) guidelines (WAI, 2004). This paper explores how, in the absence of legislation to enforce compliance, accessibility issues have not been a major feature of the Irish Government's electronic voting initiative. Comparisons are drawn with the UK Government's initiatives which are based on phased multi-channel elections, offering the electorate a range of methods for voting, all of which must comply with relevant legislation. By failing to take into account the needs of an estimated 8.3% of the population of the Republic of Ireland (Central Statistics Office, 2004), the Government's e-voting implementation is at the very least no more democratic than the existing manual ballot, and at worst an additional barrier to full and equal participation in the electoral process. The 2002 census revealed that 8.3% of the population of Ireland, or almost 320,000 people, had a long-term disability, and over half of these had more than one disability (Central Statistics Office, 2004). More females than males had a disability, and more than two-thirds of disabled people were over 50 years of age. It is less easy to estimate the number of people with disabilities in the UK, Ireland's nearest neighbour. The most recent survey, undertaken in 2001, indicated that 6.7 million people of working age had a disability (Labour Force Survey, 2001), while the OPCS survey from 1984 - 1988 concluded that 6.2 million adults in the UK were disabled, representing 14.2% of the adult population at the time. The Royal National Institute for the Blind (RNIB) estimates that two million people in the UK have a sight problem (RNIB, 2003), and 21% of the UK population is aged sixty or over (National Statistics, 2004). The UK has long-standing and recently updated legislation to protect the rights of disabled people with respect to accessible democracy. There are three main Acts with which all electronic voting initiatives must comply: the Disability Discrimination Act 1995; the Human Rights Act 1998; and the Representation of the People Act 2000. A series of guidelines has been developed by many agencies to assist in interpreting and applying the legislation (see WAI, 2004). The UK has adopted an approach to modernisation of the electoral system, based on phasing in multi-channel elections, offering the electorate a range of methods for voting which includes electronic voting. E-voting pilots have been undertaken since 2000, and trials have been carried out on kiosk systems, remote voting by electronic means (RVEM), digital television, and short messaging service (SMS). The Republic of Ireland, on the other hand, offers little in the way of legislation. The Equal Status Act 2002 (Government of Ireland, 2000) may provide some protection, but there have been no test cases as of yet [although Dáil (Irish Parliament) proceedings hinted that there may be a test case in preparation (Dáil, 2004-03-04)]. The Electoral (Amendment) Act 1996 only includes provisions for making polling stations accessible to wheelchair users. The Disability Bill 2001 should have gone some way towards enforcing accessibility; it was largely concerned with placing duties on public bodies in relation to the provision of services for people with disabilities, and would have obliged public bodies to ensure that services and buildings were accessible where possible. It also planned for the creation of a Centre For Excellence in Universal Design, to encompass electronic design as well as the physical environment (Relate, 2002a), but the bill was withdrawn in 2002, largely as a consequence of objections from groups representing disabled people. It was considered by these groups that the bill focused too much on the duties of public bodies as opposed to the rights of individuals (Relate, 2002b). This rights-based disability legislation was a long time in preparation (almost ten years), but it looks as if no further progress on pushing the bill through is imminent in the short term. The Government had no plans to publish the bill before the June elections, citing ongoing consultation for the delays. It also delayed the Education for Persons with a Disability Bill, and withdrew support for the proposed UN convention on the Rights of People with disabilities (Politics,ie, 2004b). It does, however, support the EU Charter of Fundamental Rights. In the absence of legislation to enforce compliance, accessibility issues have not been a major feature of the Irish Government's electronic voting initiative, with the result that the proposed system is far from being accessible to most users with a disability. USER-FRIENDLINESS, USABILITY AND ACCESSIBILITY: MOTIVATIONS FOR E-VOTING. The motivation for the introduction of e-voting was 'to improve the efficiency, speed, accuracy and user friendliness of Irish elections' (Dáil, 2004-03-04) which use a complex proportional representation system of ballots. It is interesting to note that the motivation was not, as is the case elsewhere, to increase voter turnout, or to widen access to participation in the electoral process. Voter turnout for the European elections in 1999 was relatively low at 50.9% (although Ireland fared much better than the UK, where turnout was only 24%) (EUObserver.com, 2004). So from the outset, it seems that accessibility was not a concern for the Irish Government. However, accessibility concerns quickly arose as the Government's intentions became clearer. User friendliness, one of the Irish Government's motivating drivers, is generally agreed to be a subjective term when applied to software and technology, and is part of the field of human-computer interaction. It can be measured to a degree by capacities such as adequacy, learnability, and robustness. It is linked to usability and accessibility, both of which have more concrete definitions. Usability is an attribute of software quality, and is defined by the International Standards Organisation (ISO) as 'the effectiveness, efficiency and satisfaction with which specified users achieve specified goals in particular environments' (ISO, 1998). Standards and metrics have been developed to quantify the usability of products, user interfaces and interaction, process quality, and organizational capability. Usability considerations relate to the ease with which users can accomplish tasks and recover from errors; they also relate to provisions for meeting the special needs of disabled users. In this respect, usability embraces the related concept of accessibility. For computers and software applications, accessibility refers to the usability of a computer system by people with disabilities; the ISO defines accessibility as 'the usability of a product, service, environment or facility by people with the widest range of capabilities' (ISO, 2003). This standard offers guidance on the development of accessible software and interactive systems for people with the widest range of visual, hearing, motor, and cognitive abilities (this includes the elderly as well as temporarily disabled people) and is intended to complement general design standards for usability. So, the terms user-friendliness, usability, and accessibility are not synonymous, although the two latter terms are closely related. User friendliness equates with simplicity of use for a typical user (Home Business Manual, 2003) or a novice or inexperienced user (Unesco, 2002); usability offers a stricter, measurable definition, and includes aspects of accessibility, which relate to disabled users. The Irish Government piloted electronic voting in three constituencies (Dublin North, Dublin West, and Meath) for the general election on 17 May 2002. This initial pilot was extended to include a further four constituencies (Dublin Mid-West, Dublin South, Dublin South-West, and Dun Laoghaire) in voting for the referendum of 19 October in the same year. The success of these pilot projects led the Government to propose the full-scale introduction of electronic voting as well as vote counting systems in all constituencies for the local and European elections and a constitutional referendum of 11 June 2004. However, these plans were postponed at the eleventh hour, when on 30 April 2004 (just six weeks before the elections) the Minister for the Environment, Heritage, and Local Government, Martin Cullen TD, announced that the proposed e-voting system would not be used in June, and that the elections would revert to the traditional paper ballot method. This statement came despite the Minister's earlier judgment that the new system was 'more accurate and more democratic' (eGovernment News, 2004). However, as the new system failed to consider disabled voters and accessibility issues, it could hardly have been considered any more democratic than the previous manual ballot system. What led the Irish Government to shelve its plans at the last minute? It was largely on the advice of the (Government-appointed) independent Commission on Electronic Voting. This Commission was appointed on 1 March 2004, to report by 1 May 2004, on 'the secrecy, accuracy and testing' (CEV, 2004) of the e-voting system procured by the Government, namely the Nedap/ Powervote system. The Commission produced an interim report; the full report will not be in the public domain until legislation confirms the statutory footing of the Commission. Basing its findings on tests, expert reports, and submissions, the Commission concluded that it was 'not in a position to recommend with requisite degree of confidence the use of the chosen system at elections in Ireland in June 2004' (CEV, 2004). Criticisms were leveled at the system on the grounds of accuracy and secrecy, and it is the issue of secrecy which relates to accessibility in particular. Secrecy is defined in the interim report: 'the secret ballot must be secret to the voter, i.e. it relates to matters concerning the possible disclosure of how a voter has voted' and secrecy has implications for disabled voters in the context of e-voting: 'there is reduced voting secrecy for persons with certain disabilities (although this is not a legal issue in the sense that, in McMahon v Attorney General the Court held that the right to secrecy is not an absolute one) as well as for persons who are unfamiliar with technology and who may need third-party assistance in using the machine' (CEV, 2004). Minister Cullen's statement on the withdrawal of the e-voting initiative concluded with a commitment to 'ensuring greater participation in elections, to communicating the importance of the democratic process and, in particular, to support greater involvement by younger voters (Politics.ie, 2004a). Again, the needs of disabled voters are not addressed explicitly, except through the vague commitment to greater participation. The Government was estimated to have spent €52m ($69.5m) on the software and hardware (including the purchase of 6,200 voting machines) (Irish Independent, 2004), and there is no indication when the system might be reintroduced. The Government's own estimates put the cost of the system at €43m ($57.5m) (Statement by Minister Martin Cullen TD, 2004). Certainly, no commitments have been made in respect of the 2007 general election, and it is unlikely that the use of standalone electronic voting will be implemented until the next local and European elections in 2009. People with disabilities do not form a homogeneous group: impairments can be physical, sensory, intellectual, psychological, or any combination of these. The elderly are also included in most definitions. The Council of Europe, in the 2002 position paper, recognised that people with disabilities may be denied human rights, including the right to vote, and that barriers to full inclusion in the democratic process include architectural barriers; illegible ballots; ballots which cannot be completed; inaccessible written information; inaccessible oral information; discriminatory registration procedures; discrimination by address; and public attitudes (IP1, 2002). The position paper advocates the use of e-voting to address shortcomings in the electoral process, but cautions that the concept of Design for All must be embraced in the development of new interactive systems, and that public websites should be compliant with the design guidelines issued by the Web Accessibility Initiative (WAI). The paper also advocates the involvement of users in the design process for any digital government service, and in particular in the stages of requirements gathering and usability testing, and it concludes that any strategy should address the key issues of 'accessibility and usability of all E-Voting devices through universal design/ design for all and user participation as early as possible in the design process' (IP1, 2002). Anecdotal evidence indicates that accessibility issues were only considered by the Irish Government well after procurement of the system, and then only as an add-on (E-voting, 2004). It is generally considered a cheaper and easier option to consider accessibility in the requirements and design stages, rather than attempting to bolt on these features in the later stages of implementation: 'Accessibility must be seen as an integral aspect of the design process, not an add-on or separate activity' (Foley & Regan, 2002). In what was a case of a missed opportunity, the Irish Computer Society, in its submission to the Commission on Electronic Voting, upheld the principle of electronic voting, citing among its advantages 'the potential to improve accessibility and privacy for persons with visual impairment, reading difficulties, etc' (Irish Computer Society, 2004). However, they objected to the Nedap/Powervote implementation on the grounds of accuracy and secrecy. They noted that while accuracy could be improved by the addition of a paper-based voter-verified audit trail [an approach advocated by Mercuri (1992) and supported in an Irish context by McGaley and Gibson (2003)], secrecy was compromised for all voters, but particularly for those with visual disabilities. They observed that the functional specification of the Nedap implementation provided for an RS-232 port to convert voter preferences to audio output, but that this capacity had not been utilized: 'we are not aware of any plans by the Department of the Environment to provide audio devices of the type mentioned, and we deplore the lost opportunity to improve access and secrecy for visually impaired voters'. In their conclusions, the authors stated that 'it is impossible to understand why the opportunity to extend the right of voting secretly to the visually impaired has not been taken, particularly since the Nedap voting machine is specifically designed to facilitate this' (Irish Computer Society, 2004). Elsewhere, the cost of this missed opportunity was quantified in Dáil proceedings (Dáil, 2004-04-08): Jan O'Sullivan, the Labour Party Equality Spokesperson, estimated that it would take €2.50 ($3.30) per voter to supply voice activation and headphones, which would enable blind or partially sighted voters to participate in the electoral process without need of assistance, thereby assuring the secrecy of the ballot. The 2002 census of population revealed that there were approximately 78,000 people with visual or hearing impairments, many of whom are also elderly, a total which represents a significant proportion of the Irish electorate, estimated at around three million voters. O'Sullivan observed that the current system was inaccessible, and raised the question: 'Should we not have examined the issue of accessibility and waited until suitable technology became available?' (Dáil, 2004-04-08). In the same proceedings, Minister Cullen defended the new system but showed a limited understanding of accessibility issues, as they appeared only to apply to the elderly, and the visually impaired; Fianna Fail Deputy Hoctor (from the same party as Minister Cullen) noted that in demonstrations, the elderly appeared to like the system as it showed candidates' photographs ('this means the system is user-friendly') (Dáil, 2004-04-08). Pressure to consider accessibility issues in relation to electronic voting appears to be growing in 2004. A new, independent commission, the Democracy Commission (with a much broader remit than the Commission on Electronic Voting) has also been accepting submissions on the theme of e-government. Irish Citizens for Trustworthy Evoting (ICTE) recognised in their submission that e-voting offers the potential of accessibility in many ways (ICTE, 2004), but they cautioned against the introduction of technology for technology's sake: 'it must never be used in such a way as to exclude those without ready access to technology'. Observing that the introduction of technology tends to favour the young, the better educated and higher earners, they warned that, 'it will fail as a tool in democracy if access to technology becomes a de facto requirement for participation in politics without becoming spread across all social groups' (ICTE, 2004). An earlier study which focused specifically on Web accessibility concluded that 'the current commitment to accessibility of the Irish Web for users with disabilities is, at best, aspirational, and at worst, cynically inadequate'. Warning that such an approach risked excluding social groups, the author also advocated legislation: 'there must surely be a role for compulsion - legislation and regulation - to fully guarantee and vindicate the rights of all citizens to equal treatment in a digital democracy' (McMullin, 2002). In the traditional paper-based method employed in elections in Ireland, there are several options for the voters with disabilities (Facilities for Voters with Disabilities, 2004), although not all of these are available to all the disabled electorate: wheelchair users can vote in an alternative polling station when their normal station is inaccessible; those with a visual impairment or physical disability may request companion voting, where a companion or the presiding officer completes the ballot form under voter instructions; voting may also be carried out by post or in hospitals and nursing homes. Companion voting in particular has implications for the principle of secrecy in voting. The proposed electronic voting implementation does not address these implications. The actual implementation was demonstrated in roadshows around the country, and there was also an online demonstration on the Government website. The main opposition party, Fine Gael, was initially in favour of the introduction of the new system, but as time went on, serious objections were raised. In particular, Fine Gael raised allegations of bias in connection with the information leaflet the Government had produced: it showed a typical voter selecting a Government (Fianna Fail) party candidate. Similarly, the Labour Party and the Green Party raised objections with particular concerns about voter-verified audit trails. 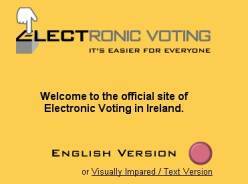 The online demonstration (which was available at http://www.electronicvoting.ie) was the subject of many criticisms. There were numerous typographical errors: on the index page, ballot was spelled 'ballott' and the term 'FAQ's' also appeared. There was a link to a 'Visually Impared [sic]/ Text Version' (see Figure 1 below). The list of political parties is far from comprehensive, and again 'ballott' is mis-spelled. When Minister Cullen announced that e-voting would be suspended for the June elections, the link to http://www.electronicvoting.ie/english/demo.html remained on the official Government website, but led to a 'page not found' message. The proposed process for electronic voting involves users going to the polling station with suitable identification and being issued with a permit by the polling clerk. The voting machines are situated in the polling booth, thereby enabling privacy. Users press buttons beside candidates' photographs to select candidates in order of preference, or in the case of a referendum they choose 'yes' or 'no'. Once choices have been made, the users press the 'cast vote' button. Confirmation that the vote has been recorded is given through an audible 'bleep' from the machine and the display light goes out. The Government produced several information leaflets for users, designed in a question-and-answer format to address user queries. Some (limited) needs are addressed in these publications. 'Electronic Voting and Counting' (Department of the Environment and Local Government, 2003a) only addresses wheelchair users: 'Can wheelchair users use the voting machine? Yes. The voting machine is wheelchair accessible'. Although no figures are available for Ireland, fewer than eight percent of disabled people in the UK use wheelchairs (Employers' Forum on Disability, 2003), so it could be concluded this is hardly representative of the disabled community. 'Electronic Voting and Counting, Your Questions Answered' (Department of the Environment and Local Government, 2003b) recognised that there were other disabilities, as it addressed the visually impaired and the elderly, although it offered no concrete immediate assistance to the visually impaired ('the Department is investigating the purchase of an attachment for use by visually impaired voters after the initial use of the machine'), and based its advice to the elderly on judgements from other, unspecified countries: 'the machine was designed to be easier to use than the traditional paper and pencil. Elderly people, in particular, have confirmed this to be the case in elections in other countries'). By adopting such a narrow interpretation of disability, the Government leaflets fail to consider the many other disabilities which exist, as well as the possibility of multiple disabilities. Indeed, the only provision they appear to have made was for wheelchair users. Minister Cullen did consult with the National Disability Authoring (NDA) and the National Council for the Blind in Ireland, but only after the electronic voting pilots, in 2002, when blind people who attended the e-voting information roadshow reported that they were unable to use the system (NCBI News, 2002). These consultations resulted in modifications to the size and legibility of candidate details, larger preference numbers, brighter displays, and a redesigned 'cast vote' button, although none of these changes would allow a person with a visual impairment to use the machine independently. In a statement in 2003, the Minister did not appear to distinguish between accessibility and user-friendliness: 'I am aware of the importance of accessibility issues and a number of improvements have been made to the voting machine to improve its user friendliness' (PWDI, 2003). Just six weeks before voters went to the polls, the Government of the Republic of Ireland was forced to withdraw its plans for the country's first all-electronic elections, and revert to the traditional paper-based ballot, at a substantial cost to taxpayers. Accessibility was not a concern of the Government in procurement of the system (ministers were only concerned with 'user-friendliness'); accessibility issues were only considered well after the system had been piloted (and only for a limited range of disabilities); and there is no domestic rights-based legislation to ensure that voters with a disability have equal access to the democratic process. This contrasts with the United Kingdom, where three Acts ensure that discrimination against the disabled community is outlawed. The Irish Government e-voting initiative failed to consider voters with a disability from the outset; it also missed opportunities to enable access, which would have been relatively low-cost. The roadshow demonstration of the new system turned out to be largely inaccessible, and the online demonstration failed to comply with even the minimum level of WAI guidelines. Information documentation only addressed wheelchair users (who were told that the system was accessible), the visually impaired (who were told that their needs would be considered in the future), and the elderly (who were told that the elderly in other countries were satisfied with the implementation). So the documentation failed to recognise the range of disabilities, and it also failed to take into account that people may suffer multiple disabilities. Although the system was withdrawn at the eleventh hour, the introduction of all-electronic elections has not been cancelled; instead, it has been postponed. The new system failed to take into account a significant proportion of the electorate, and in doing so it proved to be no more democratic than the existing manual paper ballot. It may even have posed new barriers to participation. By the time of the next elections when the system may be re-introduced, it is to be hoped that potential users with a disability might be able to make a contribution to the development process, and that there will be legislation in place to protect the rights of disabled citizens in the Republic of Ireland for equal participation in the democratic process. Department of the Environment and Local Government (2003b) Electronic Voting and Counting, Your Questions Answered, http://www.environ.ie/DOEI/DOEIPol.nsf/0/588f0ce7a372f8c480256b7c0042de9d/$FILE/Elect%20Voting%20Answers2.pdf. ISO (1998) ISO 9241-11: Guidance on Usability. ISO (2003) ISO/TS 16071: Ergonomics of human-system interaction -- Guidance on accessibility for human-computer interfaces. Paris, M. (2004). Accessible democracy and electronic voting in the Republic of Ireland. Information Technology and Disabilities E-Journal, 10(2).